When you buy the Nokia E71 it comes with a 2gb microsd card. But is that really enough? Between all your photos, music, videos, and documents it would be really nice to have more memory. Thats why it's great that the E71 supports microSDHC. This means that a card up to 32gb will work with the E71. 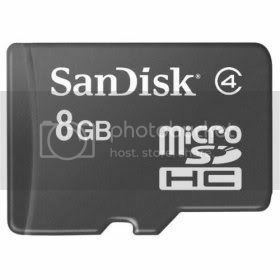 As of right now the highest microsd card available is 8gb. The 16gb cards are supposed to be coming soon but so far they haven't been released. SanDisk is pushing hard to wipe out their 8gb inventory so they are practically giving them away. The second option will give you faster data transfers but you have to take the card out of the phone. If you don't mind slower transfer speeds and don't need a reader go with the first option. All you'll have to do is plug in your E71's usb cord and put it in data transfer mode. Have you already upgraded your memory? Do you think 16gb would be necessary for the Nokia E71? The spec say E71 can support MAX 8 GB external memory card - how come 32 in your article? The E71 spec says that because 8gb is the biggest card on the market right now. The E71 supports anything that is microSDHC and SanDisk has already said they are planning on a 32gb version, probably coming next year. Have you tested this memory card? There was some problems with E51 and I want to be sure. The 8GB SDHD has the same speed as the 2GB one? That speed is a big disappointment for me, as with the rise of gigabytes and the decline of their prices, a phone - with a good speed, and USB connection - would be a perfect replacement of pendrives. I have installed a load up a 16gb on my US Version of the E71 with no problems. Karatedog is right on the transfer speed. but today, after it shows that message (again?! ), even when i read it with card reader ..... it can't be read at all!!!! found an awesome deal on a 8gb microSD! With the transfer speed issue you need to be sure is at least Class 4 before buying a card but for much better performance achivement the Class 6 cards are the best. A memory card is used in almost all media devices. Today, a lot of compressed file formats are available to help us store more on one memory card. When I go to Memory and click on it I get a message "no memory card inserted" when in fact the memory card is very much in the slot. I just got my E71 recently and am exploring the machine and need help. Do I have to register the product online? I have the default 2gb memory card. Whenever i reboot my phone, it starts installing some apps and after some time it shows "Failure, this app cannot be installed". I am thinking of formatting my memory card now. But how do i get the default installation files back?